For the American author, teacher, and explorer, see Ann Bancroft. 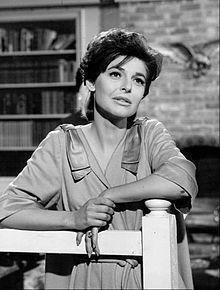 Anna Maria Louisa Italiano (September 17, 1931 – June 6, 2005), known professionally as Anne Bancroft, was an American actress, director, screenwriter and singer associated with the method acting school, having studied under Lee Strasberg. Respected for her acting prowess and versatility, Bancroft was acknowledged for her work in film, theatre, and television. She won one Academy Award, three BAFTA Awards, two Golden Globes, two Tony Awards, and two Emmy Awards, and several other awards and nominations. 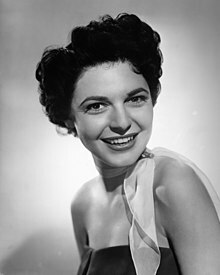 After her film debut in Don't Bother to Knock (1952) and a string of supporting film roles during the 1950s, she won an Academy Award for Best Actress for her lead role in The Miracle Worker (1962) as the teacher of teenage Helen Keller, reprising her role in the Broadway stage play, winning a Tony Award for Best Actress in a Play. On Broadway in 1965, she played a medieval nun obsessed with a priest (Jason Robards) in John Whiting's play The Devils, based on the Aldous Huxley novel The Devils of Loudun. She was perhaps best known as the seductress, Mrs. Robinson, in The Graduate (1967), a role that she later said had come to overshadow her other work. Bancroft was born Anna Maria Louisa Italiano in the Bronx, New York, the middle of three daughters of Mildred (née DiNapoli; 1908–2010), a telephone operator, and Michael G. Italiano (1905–2001), a dress pattern maker. Bancroft's parents were both children of Italian immigrants. In an interview, she stated her family was originally from Muro Lucano, in the province of Potenza. She was brought up Roman Catholic. She was raised in the Belmont neighborhood of the Bronx, later moving to 1580 Zerega Ave. and graduated from Christopher Columbus High School in 1948. She later attended HB Studio, the American Academy of Dramatic Arts, the Actors Studio and the American Film Institute's Directing Workshop for Women at the University of California, Los Angeles. After appearing in a number of live television dramas under the name Anne Marno, she was told to change her surname, as it was "too ethnic for movies"; she chose Bancroft "because it sounded dignified." In 1958, Bancroft made her Broadway debut as lovelorn, Bronx-accented Gittel Mosca opposite Henry Fonda (as the married man Gittel loves) in William Gibson's two-character play Two for the Seesaw, directed by Arthur Penn. For Gittel, she won the Tony Award for Best Performance by a Featured Actress in a Play. "Annie's a very gutsy girl. I swear I wouldn't hesitate to put her in at shortstop for the New York Yankees." 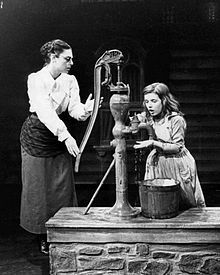 She won the Tony Award for Best Performance by a Leading Actress in a Play in 1960, again with playwright Gibson and director Penn, when she played Annie Sullivan, the young woman who teaches the child Helen Keller to communicate in The Miracle Worker. She appeared in the 1962 film version of the play and won the 1962 Academy Award for Best Actress, with Patty Duke repeating her own success as Keller alongside Bancroft. She had returned to Broadway to star in Mother Courage and Her Children, so Joan Crawford accepted Bancroft's Oscar on her behalf, and later presented the award to her in New York. Bancroft is one of ten actors to have won both an Academy Award and a Tony Award for the same role. Bancroft co-starred as a medieval nun obsessed with a priest (Jason Robards) in the 1965 Broadway production of John Whiting's play The Devils. Produced by Alexander H. Cohen and directed by Michael Cacoyannis, it ran for 63 performances. Bancroft received a second Academy Award nomination in 1965 for her performance in the 1964 film The Pumpkin Eater. Bancroft was widely known during this period for her role as Mrs. Robinson in The Graduate (1967), for which she received a third Academy Award nomination. In the film, she played an unhappily married woman who seduces the son of her husband's business partner, the much younger recent college graduate played by Dustin Hoffman. In the movie, Hoffman's character later dates and falls in love with her daughter. Bancroft was ambivalent about her appearance in The Graduate; she said in several interviews that the role overshadowed her other work. Despite her character becoming an archetype of the "older woman" role, Bancroft was only six years older than Hoffman. A CBS television special, Annie: the Women in the Life of a Man (1970), won Bancroft an Emmy Award for her singing and acting. Bancroft is one of very few entertainers to win an Oscar, an Emmy and a Tony award. She followed that success with a second television special, Annie and The Hoods (1974), which was telecast on ABC and featured her husband Mel Brooks as a guest star. She made an uncredited cameo in the film Blazing Saddles (1974), directed by Brooks. She received a fourth Academy Award nomination for Best Actress in 1977 for her performance in The Turning Point (1977) opposite Shirley MacLaine, and a fifth nomination for Best Actress in 1985 for her performance in Agnes of God (1985) opposite Jane Fonda. Bancroft made her debut as a screenwriter and director in Fatso (1980), in which she starred with Dom DeLuise. Bancroft was the original choice to play Joan Crawford in the film Mommie Dearest (1981), but backed out, and was replaced by Faye Dunaway. She was also a front-runner for the role of Aurora Greenway in Terms of Endearment (1983), but declined so she could act in the remake of To Be or Not to Be (1983), with her husband Mel Brooks. In 1988 she played Harvey Feirstein's mother in the film version of his play Torch Song Trilogy. In the 1990s and the first half of the 2000s, Bancroft took supporting roles in a number of films in which she co-starred with major film stars—including Honeymoon in Vegas (1992) with Nicolas Cage, Love Potion No. 9 (1992) with Sandra Bullock, Malice (1993) with Nicole Kidman, Point of No Return (1993) with Bridget Fonda, Home for the Holidays (1995) with Robert Downey Jr. and directed by Jodie Foster, How to Make an American Quilt (1995) with Winona Ryder, G.I. Jane (1997) with Demi Moore, Great Expectations (1998) with Gwyneth Paltrow, Keeping the Faith (2000) with Ben Stiller, and Heartbreakers (2001) with Jennifer Love Hewitt, Sigourney Weaver and Gene Hackman. She also lent her voice to the animated film Antz (1998), which also featured performances from Jennifer Lopez, Sharon Stone, and Woody Allen. Bancroft also starred in several television movies and miniseries, receiving six Emmy Award nominations (winning once for herself and shared for Annie, The Women in the Life of a Man), eight Golden Globe nominations (winning twice), and two Screen Actors Guild Awards. Her final appearance was as herself in a 2004 episode of HBO's Curb Your Enthusiasm. Her last project was the animated feature film Delgo, released posthumously in 2008. The film was dedicated to her. Bancroft's first husband was lawyer Martin May; they married in 1953, separated in 1955, and divorced in 1957. In 1961, Bancroft met Mel Brooks at a rehearsal for the Perry Como variety show (Kraft Music Hall). Bancroft and Brooks married on August 5, 1964, at the Manhattan Marriage Bureau near New York City Hall, and remained married until her death. Their son, Maximillian "Max" Brooks, was born on May 22, 1972. In a 2010 interview, Brooks credited Bancroft as being the guiding force behind his involvement in developing The Producers and Young Frankenstein for the musical theatre. In the same interview, he said of their first meeting in 1961, "From that day, until her death on June 5, 2005, we were glued together." In April 2005, two months before her death, Bancroft became a grandmother when her daughter-in-law Michelle gave birth to a boy, Henry Michael Brooks. Anne Bancroft died of uterine cancer at age 73 on June 6, 2005, at Mount Sinai Hospital in Manhattan. Her death surprised many, including some of her friends, as the intensely private Bancroft had not released details of her illness. Her body was interred at Kensico Cemetery in Valhalla, New York, near her parents, Mildred (who died in April 2010, five years after Anne) and Michael Italiano. A white marble monument with a weeping angel adorns the grave. Her last film, Delgo, was dedicated to her memory. 1994 The Simpsons Dr. Zweig Voice role, one episode: "Fear of Flying"
^ a b "Anne Bancroft". The Daily Telegraph. June 9, 2005. Retrieved June 15, 2015. ^ Anne Bancroft profile, filmreference.com; accessed September 29, 2014. ^ "Paid Notice: Deaths ITALIANO, MICHAEL G." The New York Times. April 13, 2001. Retrieved September 8, 2013. ^ "Anne Bancroft: God bless you, Mrs. Robinson" (in Italian). liberaeva.com. Retrieved February 16, 2015. ^ "Mel Brooks – Director, Actor, Writer and Producer". h2g2. BBC. Retrieved September 19, 2010. ^ "About Our Neighborhood: Bronx Little Italy". Retrieved April 10, 2016. ^ "Tony Facts and Trivia". TonyAwards.com. Retrieved February 20, 2018. ^ "The Devils" profile, IBDb.com; accessed September 29, 2014. ^ "Annie, the Women in the Life of a Man (1970)". ^ Rausch, Andrew J. (2003). Hollywood's All-Time Greatest Stars: A Quiz Book. Citadel Press. ISBN 9780806524696. ^ "Anne Bancroft - Hollywood Star Walk - Los Angeles Times". projects.latimes.com. ^ "Anne Bancroft". walkoffame.com. Hollywood Chamber of Commerce. ^ "On Stage, and Off". New York Times. December 6, 1991. ^ Leonard, Tom (April 12, 2008). "Anne Bancroft: 1931-2005 Here's to you, Mrs Robinson". The Daily Telegraph. Retrieved June 15, 2015. ^ Carucci, John (March 3, 2010). 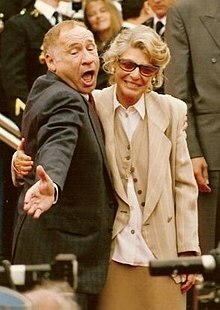 "Brooks Recalls Anne Bancroft as Wife, Collaborator – Mel Brooks Reminisces of Wife Anne Bancroft as Anniversary of Their First Meeting Draws Near". Associated Press. Retrieved August 29, 2010. ^ "The Brooks Family of Writers: Michelle, Max and Mel". November 9, 2010. Retrieved June 15, 2015. ^ Staff writer. (June 8, 2005). "Graduate Star Anne Bancroft Dies – Oscar-Winning Actress Anne Bancroft, Who Starred Opposite Dustin Hoffman in Film Classic The Graduate, Has Died". BBC News. Retrieved August 29, 2010. ^ Burleigh, James (June 8, 2005). "Anne Bancroft dies of cancer at 73". The Daily Telegraph. Retrieved June 15, 2015. Wikimedia Commons has media related to Anne Bancroft.